3 Section Car Trunk Organizer Only $5.49 Shipped! 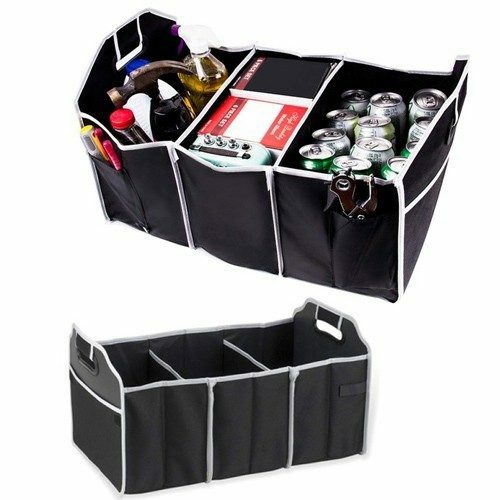 You are here: Home / Great Deals / 3 Section Car Trunk Organizer Only $5.49 Shipped! Keep everything you need for emergencies or everyday activities in the back of your car, van or suv without worrying it will roll around or get lost under the seats. This collapsible trunk organizer has three large sections that can hold sports gear, backpacks, books, groceries or safety items. An outer mesh pocket is just the right size to hold maps, shopping lists, coupon books, etc. Get the 3 Section Car Trunk Organizer for Only $5.49 Shipped! When it’s not needed, the organizer folds up like an accordion and is secured into a compact package with velcro strips. Sturdy built-in handles make it easy to load and unload the entire organizer and transport it from the house to the car and back. The trunk organizer is constructed of durable 600D poly-canvas for easy cleaning and durability.